A re-elected Rudd Labor Government will provide federal funding to upgrade facilities at the Marrickville Golf Sporting and Community Club. 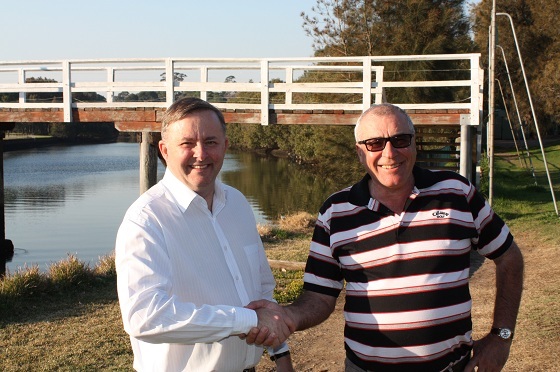 Federal Member for Grayndler, Anthony Albanese today announced the government would provide $340,000 for a new verandah and function space which will help the club cater for the needs of the growing community and hold more community functions. “Located on the banks of the Cooks River, the Club has been an important part of the Marrickville community for over 60 years. It’s not only one of the busiest clubs in Sydney with over 25,000 games played every year, but the Club is also home to junior golf programs and has been used as a hosting venue for Seniors Week events. “The Club will continue to grow in popularity and this funding will help it to thrive for many years to come. The upgrade of facilities at the Marrickville Golf Sporting and Community Club will build on the funding the Rudd Labor Government has already provided to boost community infrastructure in the Inner West. Funding for this project is included in the budget.